Home » VectorVest » Reiterate buy Premier Oil #PMO says VectorVest. A sharp improvement in trading, cashflow and outlook. Reiterate buy Premier Oil #PMO says VectorVest. A sharp improvement in trading, cashflow and outlook. By Alan Green in VectorVest on 8th November 2017 . Premier Oil plc (PMO.L) engages in the exploration, development, and production of oil and gas properties. The Company’s operations are located and managed in six business units: the Falkland Islands, Indonesia, Pakistan (including Mauritania), the UK, Vietnam and the Rest of the World. In total, the Company manages approximately 760 million barrels of oil equivalent (mmboe). The Company has production rates of over 90 thousand barrels of oil equivalent per day (kboepd). The Company focuses on producing 68 to 73 kboepd. The Company’s four-well North Falklands Basin campaign targets multiple stacked fans in PL004 and PL032 using the Eirik Raude rig. The Company owns an interest in over two licenses, such as Natuna Sea Block A and Kakap. VectorVest first published a note on PMO in March this year, where we highlighted how debt restructuring worries had weighed heavily on the share price. The solid progress delivered since our March note underscores the opportunity on offer, although the PMO RS (Relative Safety) metric scores a poor 0.82 on a scale of 0.00 to 2.00. However, the RT (Relative Timing) metric, a fast, smart and accurate indicator of a stock’s price trend sees PMO score 1.61, which is excellent on a scale of 0.00 to 2.00, and this is backed up by an excellent GRT (Earnings Growth Rate) rating of 34%. GRT reflects a company’s 1-3 year forecasted earnings growth rate in % per year. VectorVest values PMO at 100p per share, meaning that despite the recent recovery to 76p, the stock remains undervalued. The chart of PMO.L is shown above. 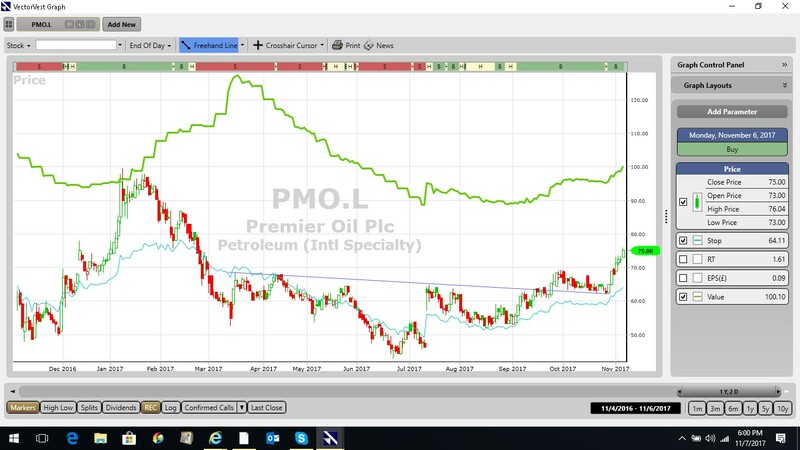 The price action is in candlestick format while the VectorVest calculated valuation of PMO.L is shown by the green line study above the price. The share is on a BUY recommendation on VectorVest with the last BUY signals occurring at the start of September 2017. Of note to technical analysts is the completed “inverted head and shoulders reversal pattern”. This pattern has a strong base since March 2017 and is technically very positive for the share. Summary: PMO is scheduled to deliver a further trading update in late November. As in our previous note, we have highlighted PMO as an opportunity to aggressive traders, but unlike our previous note, the RT (Relative Timing), (GRT) Earnings Growth and Valuation all point to a sharp improvement in trading, cashflow and outlook. With the financial restructuring complete, PMO is now flagged as a Buy on the VectorVest platform, although cautious traders may want to wait until after the trading update before making a move. 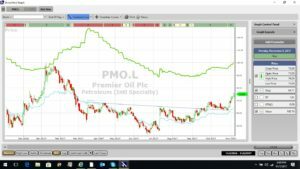 Readers can examine trading opportunities on PMO and a host of other similar stocks for a single payment of £5.95. This gives access to the VectorVest Risk Free 30-day trial, where members enjoy unlimited access to VectorVest UK & U.S., plus VectorVest University for on-demand strategies and training. Link here to view..